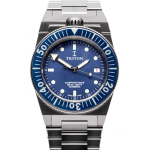 Watches and Art > Products > Triton > Triton Subphotique blue dial. 40mm steel case. 500 meters waterresistant. You may look at this watch and think why is the crown at 12? Well, this design is based on a 1960s wristwatch. And let me tell you, it is a very comfortable design. 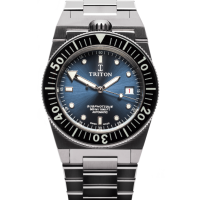 This is a Triton with blue dial on steel bracelet. The watch can also be had with other straps. Please ask about it. This watch is based on a 1960s design of the socalled “Triton Spirotechnique” which had the crown at the 12 o’clock position as well. 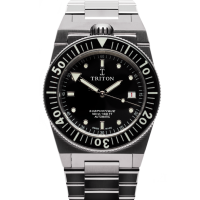 The vintage originall Triton had a smaller 37mm case while the new watch has a 40mm steel case. The “Spirotechnique” came to market in 1963 and was supposedly worn by the famous marine scientist and diver JJ Cousteau. While the vintage watch has an automatic ETA caliber, the modern watch now comes with an automatic Soprod caliber. Triton was the son of Poseidon. The new name “Subphotique” is used due to the legal ownership of the name “Spirotechnique” by a company called “Auricoste”. 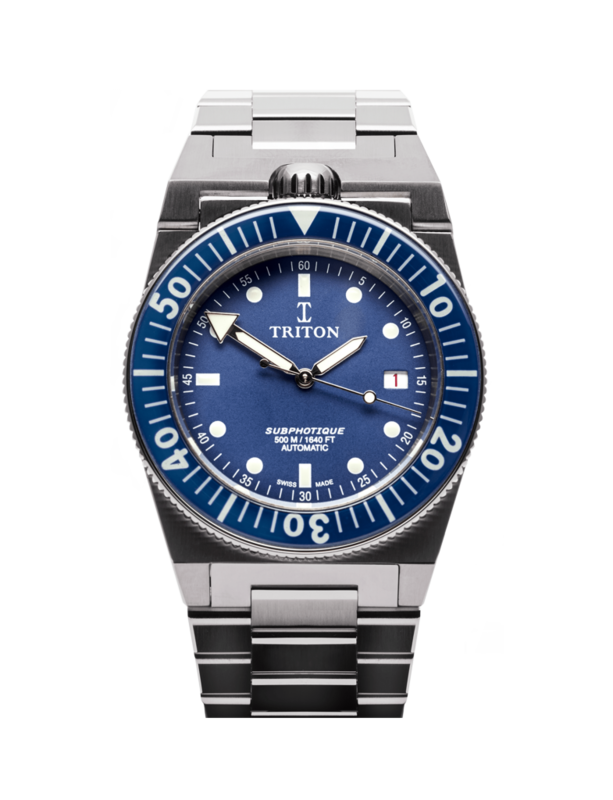 I am officially representing the company Triton and you can get any of their watches through me. I am based around Cologne, Düsseldorf and Bonn and you can meet me around there in Germany. We possess 20 years of experience trading vintage watches which helps us to satisfy your needs and make sure that you get the watch you deserve and expect. 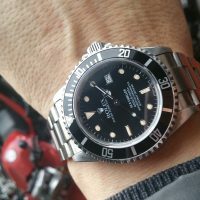 SOLD – Rolex Sea-Dweller Triple Six Ref. 16660 fullset w/t box, papers, Bühlmann table, bracelet tool, booklets. 2 Rolex revisions documented. Great opportunity.